Thorium is a naturally occurring, mildly radioactive element. To use it in a nuclear reactor, thorium must absorb neutrons, a process that eventually converts it to an artificial isotope of uranium, uranium-233. U-233 is fissile, and when it absorbs a neutron it generally fissions, releasing two or three neutrons plus a million times more heat (energy) than burning an equivalent mass of fossil fuel. 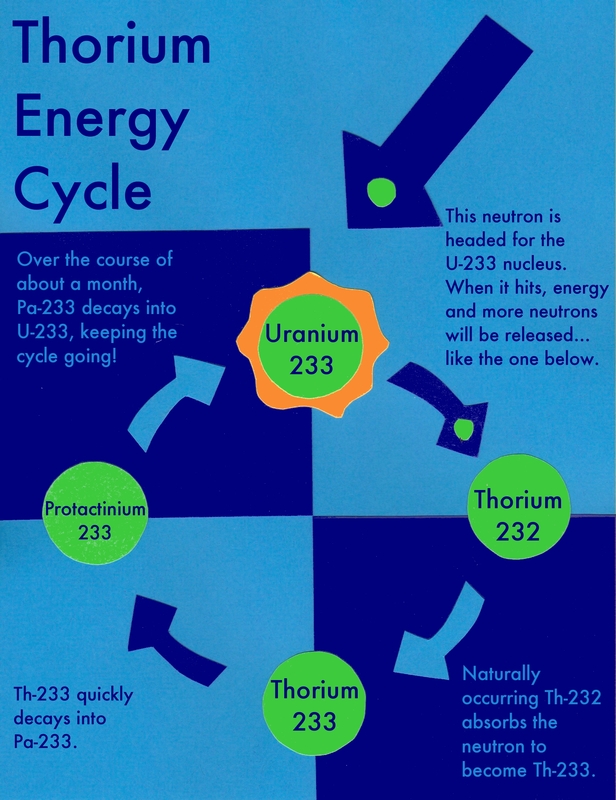 It takes two neutrons to release energy from thorium and U-233 can supply them, which means it is theoretically possible to sustain energy release from thorium indefinitely. This is the basis of a thorium reactor. To that end, Oak Ridge engineers built four liquid-fueled reactors. Two used water-based liquids, and two were based on liquid fluoride salts. The water-based reactors had to operate at high pressures to generate the temperatures needed for economical power generation. They could also dissolve uranium compounds, but not those containing thorium, which made fuel reprocessing as complicated for the water-based rectors as it is for solid-fueled versions. The fluoride reactors had neither of these drawbacks. They could operate at high temperature without pressurization. They could also dissolve both uranium and thorium in their fluoride-salt mixtures, and the mixtures were impervious to radiation damage due to their ionic bonds. Therefore, Oak Ridge engineers opted to concentrate on the technically superior liquid-fluoride-salt approach in future R&D. In the late 1960s, however, the director of Oak Ridge National Lab, Alvin Weinberg, was fired by the U.S. Atomic Energy Commission for his advocacy for this type of reactor and his efforts to enhance the safety of conventional light-water reactors, a design he had patented. With Weinberg’s departure, the AEC squashed research in liquid-fluoride reactors in favor of liquid-sodium-metal-cooled fast breeder reactors, which were based on converting conventional uranium to plutonium. Technical overlap between the two programs was almost nonexistent, so after cancellation, research into liquid-thorium reactors faded away. Recent efforts to resurrect the thorium-fluoride reactor technology has focused on a new variant of the concept called the Liquid-Fluoride Thorium Reactor (LFTR, pronounced “lifter”). In a LFTR, the reactor vessel contains two types of liquid-fluoride salts. One, the fuel salt, holds the fissile fuel (U-233) that sustains the nuclear reaction. The other, the blanket salt, has enough thorium to absorb about half of the neutrons from fission and produce more U-233. The blanket salt also shields the reactor vessel from neutron damage and gamma-ray irradiation. As thorium in the blanket converts to U-233, it is physically transferred to the fuel salt, where it fissions, releasing neutrons and heat. Heat moves to a coolant salt outside the core, then to the working fluid of a closed-cycle gas-turbine engine to generate electricity. Waste heat can be rejected to either air or water, depending on the availability of cooling water. Waste heat could also be used to, for example, desalinate seawater, letting it profitably produce potable water.